Well as the dust settles on the Internet's worst kept secret, a Search deal between Yahoo and Microsoft has been announced. However as the news spills out into the blogosphere and into mainstream sources there are a number of questions that need to be answered. In fact we have 20 of our own questions that we would like answered. How many Yahoo engineers will be looking for work? How effective or not was Microsoft's marketing campaign for BING? Why now? What changed in 16 months since initial talks began? What is going to happen to Yahoo's new homepage? What happened to the name KUMO? What will become of the user data that Yahoo has acquired over the years? 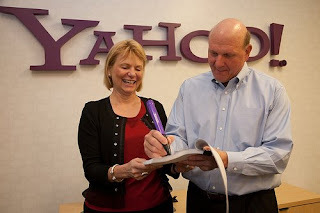 Will Steve Ballmer stop acting crazy now? Just how much will this change the Search Landscape? What will Google's reaction be? Does this mean that Microsoft failed at Search and need the resources and efforts of Yahoo to compete in the Search arena? Will we see some new players in Search emerge? Will the deal mean a better search experience for me personally and for searchers overall? What is Jerry Yang thinking? Yahoo's (YHOO) share price dropped 11.15% after the announcement. How will investors react to the deal? Which sounds better, Binghoo or Yah-Bing? Is having Microsoft`s Bing being the exclusive algorithmic search and paid search platform for Yahoo! sites really a good idea? Why is Twitter so popular? (ok we threw this one in for filler and to see if you were paying attention). The Yahoo / Microsoft deal is big news, it should prove interesting to see how everything will play out. I would like to hear what the Google Guys had to say about the initial announcement. It should not have come as any shock to them as discussions about the deal date back to 2007.